Fifty of the State's most outstanding white-tailed deer from the 2001-02 hunting season were on display at the 14th Annual Garden State Deer Classic held during the Garden State Outdoor Sportsmen's Show, January 9-12 in Raritan Center, Edison. The Deer Classic is an annual event showcasing hunter entries in New Jersey's Outstanding White-tailed Deer Program, which was initiated by the New Jersey Department of Environmental Protection's Division of Fish and Wildlife in 1964. This year's Deer Classic was jointly sponsored by the Division of Fish and Wildlife, the New Jersey State Federation of Sportsmen's Clubs, the United Bowhunters of New Jersey and a new sponsor, Outdoor Sportsmen's Shows, Inc. This was the first year the Classic was held in conjunction with the Garden State Outdoor show bringing the display of outstanding New Jersey deer to the largest audience in the history of the Deer Classic. This year's 60-foot display of outstanding antlered deer from the 2001-2002 hunting season included a special section where three all-time New Jersey Record Deer were on display. In addition to the deer display, visitors experienced seminars by a variety of deer experts, biologists and noted deer hunters on each of the four days of the outdoor show. Division of Fish and Wildlife deer biologists were also on hand each day to answer questions, provide information and score antlers for anyone who brought their antlers to the display area. Outstanding deer are those that meet certain criteria for antler development or weight as determined by New Jersey's Outstanding White-tailed Deer Program. All antlered deer are scored using the Boone & Crockett Club scoring system that gives credit to antler length, spread, number of points and symmetry. A minimum Boone and Crockett score of 125 is required for an antlered deer to be eligible for entry in the Outstanding Deer Program. The program includes categories for typical and non-typical antlered deer taken with bow, shotgun and muzzleloading rifle in addition to the 200-pound buck and 135-pound doe field-dressed weight categories. 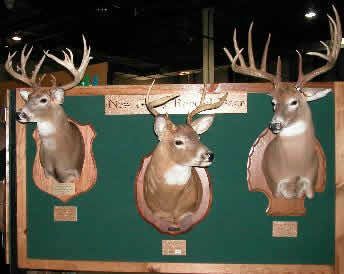 The next Garden State Deer Classic will be held again at the Garden State Outdoor Show in January of 2004. Application forms to enter deer taken during the 2002-2003 hunting seasons can be obtained on this Division's website or by sending a self-addressed, business-size stamped ($0.60) envelope to: NJ Division of Fish and Wildlife, Outstanding Deer Program, PO Box 400, Trenton, NJ 08625-0400. A standing room only crowd was on hand for the special awards program that was held on Sunday, January 12 for the top three 2001-2002 entries in each category. Two entries in the Typical Muzzleloader category moved into the top three slots on the all time New Jersey list for that category. A Hunterdon County deer entered by Marty French from Ringoes is a new state record with an impressive score of 159. Ivan Vandenberghe from Hewitt took second this year in the Typical Muzzleloader category with a Sussex County deer that scored 155 5/8, putting it in the number three slot in the record book for that category. The list of the 2001-02 winners is available online in PDF format. Files in PDF format require the Adobe Acrobat Reader, available free from Adobe's Web site.